Before he began his finance career, Joe Badal was a decorated military officer, having served in the U.S. Army for 6 years, including tours of duty in Vietnam and Greece. He was awarded the bronze star medal, the meritorious service medal, and the Army Commendation Medal(2). 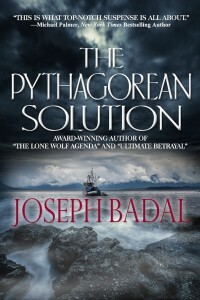 Joe has had ten suspense novels published: The Pythagorean Solution, Evil Deeds, Terror Cell, The Nostradamus Secret, Shell Game, The Lone Wolf Agenda, Ultimate Betrayal, Borderline, Death Ship, and The Motive. His short stories, “Fire & Ice,” “Ultimate Betrayal,” and “The Rock” were included in anthologies. Joe also writes a monthly blog titled Everyday Heroes. He is a member of International Thriller Writers, Sisters in Crime, Croak & Dagger, Military Writers Society of America, Western Writers of America, New Mexico Book Coop, and SouthWest Writers, and was recently named one of the 50 Best Authors You Should Be Reading. The Lone Wolf Agenda, was awarded first prize for fiction-mystery/thriller in the 2013 New Mexico/Arizona Book Awards, and Ultimate Betrayal received the 2014 Tony Hillerman Award for best fiction book. The Military Writers Society of America awarded Evil Deeds its silver medal for best mystery/thriller in 2015. Death Ship was a finalist for best mystery/thriller in the New Mexico/Arizona Book Awards contest. 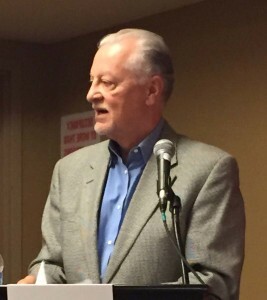 Albuquerque Magazine named Joe the top author in its 2015 Best of the City contest. 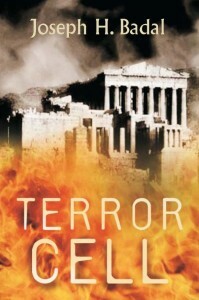 When recently-divorced American John Hammond arrives on the Aegean island of Samos, he is unaware of events that happened nearly seven decades earlier that will embroil him in death and violence, and change his life forever. On a day in 1971, Liz and Bob Danforth’s nightmare begins with the kidnapping of their 2-year-old son, Michael. So begins a decades-long journey that takes the Danforth family from the kidnapping and their son’s eventual rescue, to his service with the U.S. Army in the Balkans and Bob’s service with the CIA. 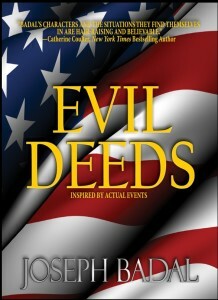 Evil Deeds is an adrenaline-boosting story about revenge and the triumph of good over evil. 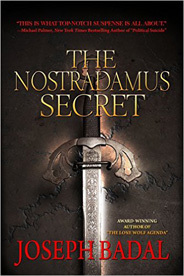 The Nostradamus Secret, book three in the 5-book Danforth Saga, builds on Nostradamus’s “lost” 58 quatrains and segues to present day. These lost quatrains have surfaced in the hands of a wealthy Iranian megalomaniac who believes his rise to world power was prophesied by Nostradamus. But he sees the United States as the principal obstacle to the achievement of his goals. So, the first step he takes is to attempt to destabilize the United States through a vicious series of terrorist attacks and assassinations. Joseph Badal offers up another action-packed story loaded with intrigue, fascinating characters, and geopolitical machinations that put the reader on the front line of present-day international conflict. 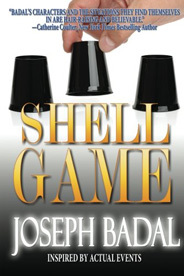 Shell Game is a financial thriller using the economic environment created by the capital markets meltdown that began in 2007 as the backdrop for a timely, dramatic, and hair-raising tale. Joseph Badal weaves an intricate and realistic story about how a family and its business are put into jeopardy through heavy-handed, arbitrary rules set down by federal banking regulators, and by the actions of a sociopath in league with a corrupt bank regulator. Although a work of fiction, Shell Game, through its protagonist Edward Winter, provides an understandable explanation of one of the main reasons the U.S. economy continues to languish. It is a commentary on what federal regulators are doing to the United States banking community today and, as a result, the damage they are inflicting on perfectly sound businesses and private investors across the country and on the overall U.S. economy. With The Lone Wolf Agenda, (the 4th book in the Danforth Saga), Joseph Badal returns to the world of international espionage and military action thrillers and crafts a story that is as close to the real world of spies and soldiers as a reader can find. This installment in the Danforth Saga brings Bob Danforth out of retirement to hunt down a lone wolf terrorist cell bent on destroying America’s oil infrastructure. 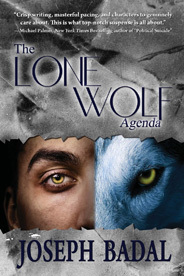 The Lone Wolf Agenda pairs Danforth with his son Michael, a senior DELTA Force officer, as they combat an OPEC-supported terrorist group allied with a Mexican drug cartel. This story is an epic adventure that will chill readers as they discover that nothing, no matter how diabolical, is impossible. 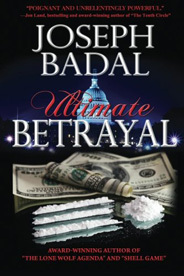 Ultimate Betrayal, Joseph Badal’s 8th thriller, was inspired by actual events. It takes the reader from South Philadelphia, through the Afghanistan War, to Mafia drug smuggling, to the halls of power at the CIA and the White House. David Hood comes from the streets of South Philadelphia, is a decorated Afghanistan War hero, builds a highly successful business, marries the woman of his dreams, and has two children he adores. But there are two ghosts in David’s past. One is the guilt he carries over the death of his brother. The other is a specter that will do anything to murder him. David has long lost the belief that good will triumph over evil. The deaths of his wife and children only reinforce that cynicism. And leaves him with nothing but a bone-chilling, all-consuming need for revenge. Barbara Lassiter and Susan Martinez, two New Mexico homicide detectives, are assigned to investigate the murder of a wealthy Albuquerque socialite. They soon discover that the victim, a narcissistic borderline personality, played a lifetime game of destroying people’s lives. As a result, the list of suspects in her murder is extensive. The detectives find themselves enmeshed in a helix of possible perpetrators with opportunity, means, and motive—and soon question giving their best efforts to solve the case the more they learn about the victim’s hideous past. Their job gets tougher when the victim’s psychiatrist is murdered and DVDs turn up that show the doctor had serial sexual relationships with a large number of his female patients, including the murder victim. 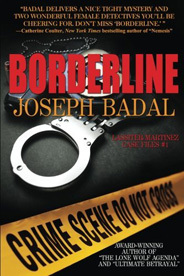 Borderline presents a fascinating cast of characters, including two heroic female detective-protagonists and a diabolical villain; a rollercoaster ride of suspense; and an ending that will surprise and shock the reader. 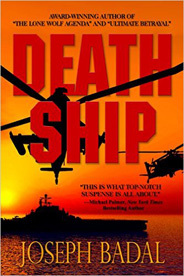 Death Ship is another suspense-filled thriller in the 45-year-long journey of the Danforth family. This fifth book in the Danforth Saga introduces Robbie Danforth, the 15-year-old son of Michael and Miriana Danforth, and the grandson of Bob and Liz Danforth. A leisurely cruise in the Ionian Sea turns into a nightmare event when terrorists hijack a yacht with Bob, Liz, Miriana, and Robbie aboard. Although the boat’s crew, with Bob and Robbie’s help, eliminate the hijackers, there is evidence that something more significant may be in the works. The CIA and the U.S. military must identify what that might be and who is behind the threat, and must operate within a politically-corrupt environment in Washington, D.C. At the same time, they must disrupt the terrorist’s financing mechanism, which involves trading in securities that are highly sensitive to terrorist events. Michael Danforth and a team of DELTA operatives are deployed from Afghanistan to Greece to assist in identifying and thwarting the threat. 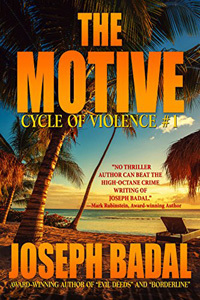 In The Motive, Joseph Badal presents the first book in his new series, Cycle of Violence. This latest addition to Badal’s offering of acclaimed, best-selling thrillers delivers the same sort of action and suspense that readers have come to expect and enjoy from his previous nine novels. Confronted with suspicious information relating to his sister Susan’s supposed suicide in Honolulu, Albuquerque surgeon Matt Curtis questions whether his sister really killed herself. With the help of his sister’s best friend, Renee Drummond, and his former Special Forces comrade, Esteban Maldonado, Matt investigates Susan’s death. But Lonnie Jackson, the head of organized crime in Hawaii, afraid that Matt has gotten too close to the truth, sends killers after him. There is a peculiar allure of insidious characters—and especially assassins, hit men, and their ilk. Perhaps we find their uncomplicated moral codes and brutal efficiency appealing. These characters care little about ethics—and perhaps that alone, that freedom from guilt, is exactly why we love them. Perhaps, deep down, we wish we could be like them. And perhaps, by reading stories with such characters, we can vicariously experience that thrill. 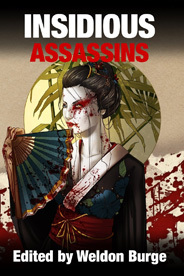 With this fascination with evil characters in mind, Smart Rhino Publications decided to publish this anthology, Insidious Assassins, a sequel to Uncommon Assassins. The book contains 24 stories by some of the best horror, suspense, science fiction, and fantasy authors writing today. Here you will meet some truly insidious characters—characters you may find yourself applauding when you know you shouldn’t. Avaricious, cruel, depraved, envious, mean-spirited, vengeful—the wicked have been with us since the beginnings of humankind. You might recognize them and you might not. But make no mistake. When the wicked cross your path, your life will never be the same. Do you know someone wicked? You will. 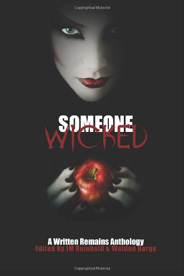 The 21 stories in the Someone Wicked anthology were written by the members of the Written Remains Writers Guild and its friends, and was edited by JM Reinbold and Weldon Burge.